Browsing articles tagged with " orthopaedic investigation"
Ultrasound scans are images of the internal organs created from sound waves. The images are produced when the sound waves are directed into the body then reflected back to a scanner that measures them. The ultrasound scanner looks like a small paint roller. As it moves back and forth over the body, it sends sound waves through the skin and muscles. These waves are then turned into an image that appears on a TV screen. What does Ultrasound used for? • Help to monitor the growth of an unborn child, and check for abnormalities. • Detect abnormalities of heart structures such as the heart valves. A Computerised Tomography (CT) scanner is a special kind of X-ray machine. Instead of sending out a single X-Ray through your body as with ordinary X-Ray, several beams are sent simultaneously from different angles. Thus the result of Computerised Tomography (CT) scan is much more detailed compare to X-Ray. How does a Computerised Tomography (CT) scanner work? 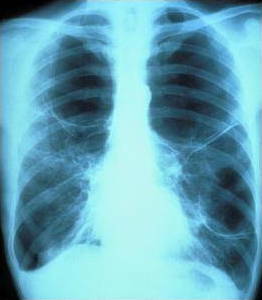 The X-Ray from the beams are detected after they have passed through the body and their strength is measured. A computer can use this information to work out the relative density of the tissues examined. How is a Computerised Tomography (CT) scan carried out? 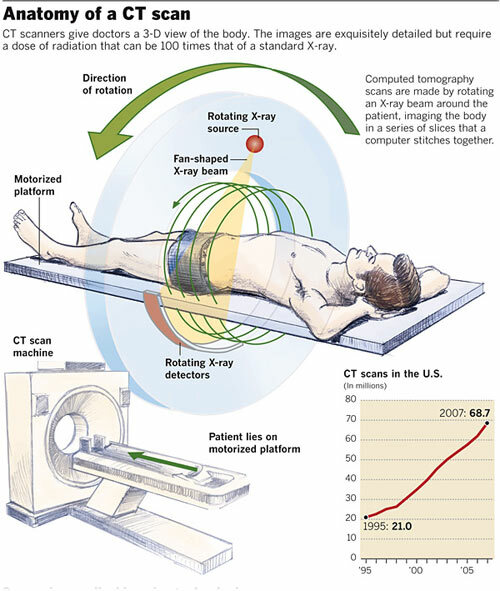 During the scan the patient lies on a bed, with the body part under examination placed in the opening of the scanner. The bed then moves slowly backwards and forwards to allow the scanner to take pictures of the body. The length of the test depends on the number of pictures and the different angles taken. MRI uses a powerful magnetic field, radio frequency pulses and a computer to produce detailed pictures of organs, soft tissues, bone and virtually all other internal body structures. The images can then be examined on a computer monitor. How safe is Magnetic Resonance Imaging (MRI)? MRI is quite safe in the majority of patients. Certain patients are unable to do an MRI such as people that are nervous in small spaces (claustrophobic) and those with implanted medical devices such as aneurysm clips in the brain, heart pacemakers and cochlear (inner ear) implants. Also, people with pieces of metal close to or in an important organ (such as the eye) may not be scanned. There are a few additional safety considerations and some exceptions based on individual circumstances. 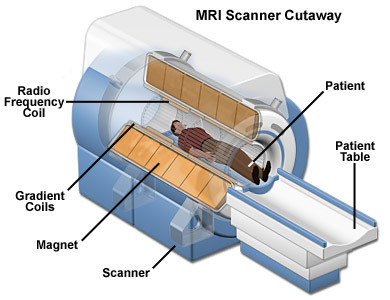 As MRI is using powerful magnetic field it may disrupt the scan images or even damage the items that is magnetic. What are the uses and advantages of a Magnetic Resonance Imaging (MRI) scan? Magnetic Resonance Imaging (MRI) scanners are good at looking at the non-bony parts or soft tissues of the body. In particular, the brain, spinal cord and nerves are seen much more clearly with MRI than with regular x-rays and CAT scans. Also, muscles, ligaments and tendons are seen quite well so that MRI scans are commonly used to look at knees and shoulders following injuries. A MRI scanner uses no X-Ray or other radiation. A disadvantage of MRI is it’s higher cost compared to a regular X-Ray or CAT scan.